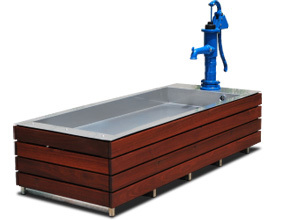 Splashpond - hand water pump, pond and storage tank all-in-one. Designed for early childhood learning centres to allow children to discover water through play and learning. Little muscles bring the hand water pump to life, and cool water gushes from its spout into the pond - keep pumping to fill the pond and discover the pleasures and enjoyment water offers. No need to stop pumping - an overflow returns the water to the tank. Waterscapes are interactive landscapes for kindergartens and preschools. Focused on rainwaters natural journey, children experience and learn to appreciate rainwater and our environment through an outdoor play space, involving: rain tanks, hand water pumps, watercourses, raingardens, indigenous gardens and edible gardens. Hand Water Pumps connected to a rain tank can be used by children for garden watering and play, and the physical and mental interaction will help instill the importance of rainwater, here and around the world. Safety features are added to minimise injury risks. 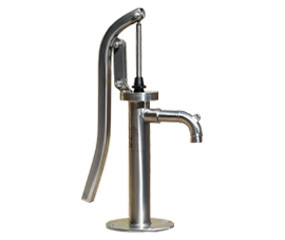 The beautifully crafted, hand polished, Stainless Steel Hand Water Pump is specifically designed for use by preschool children. Smooth, low resistance lever action makes pumping water easy for all children. Pressurised operation allows hose connection for more water activities. The Nautilus Filter Diverter simply intersects a downpipe to divert filtered rainwater to a rain tank, and when full, diverts filtered rainwater back into the downpipe - a breakthrough system to protect our waterways and, for safer, easier and healthier rain tank usage. Made from steel with a choice of Colorbond colour finishes bring style and longevity to the system. Waterseats - A rain tank in a seat! 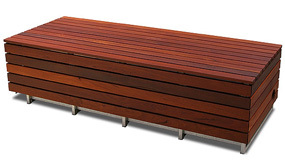 Waterseats are an innovative solution for rainwater storage and creating functional space. Stored water can be used to sustain billabongs, ponds, rain gardens, garden beds and topping up swimming pools, and its low height enables connection to hand water pumps - a popular combination in kindergartens. Rainwell designs and manufactures specialist products for innovative rainwater harvesting and stormwater management systems. Rainwell also design spaces and systems for the early childhood education sector to allow children to enjoy and discover rainwater, and learn about the benefits it brings to our natural and made environments. Harvesting rainwater from your roof can result in significant water and cost savings, and will help in reducing volumes of stormwater and pollutants discharged to our waterways, and if done by enough people, can even reduce the peaks of flood events.